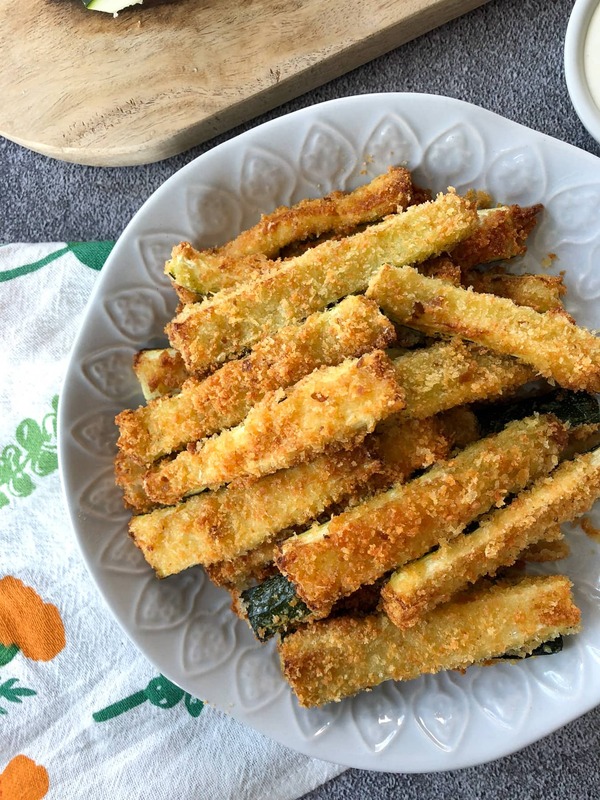 This recipe for Airfryer Zucchini Fries is so simple and delicious! Made in less than 30 minutes and with just 5 ingredients, they’re perfect for busy weeknight suppers! It’s hard to believe that it’s half way through September and the kids have been back to school for two weeks already! Time flies, and all of a sudden summer is over and fall is here. And these are very busy days…this time of year is all about planning, organizing and getting back into routine. Because between the school shuffle, fall sports, and me back to work full time, it can feel very chaotic. I’m also very relieved for the routine of it all. One thing I love most about fall is the routine of meal making. Because we’re back to a schedule, it’s much easier for me to take the time to think more about what we’re eating, and make meal plans. I don’t want to be thinking about what’s for dinner every day, I want a plan. What are we having, and how can I get it on the table quick? My biggest cooking tip and time saver is to use ingredients that are in season. This is also a really great way to keep the grocery bills manageable. And there’s no better time than early fall to stock up on seasonal produce. I buy loads of fresh market vegetables and start there for my meal planning. Soups and stews with fresh garden carrots and potatoes. Roasted chicken with roasted seasonal vegetables. The possibilities are endless. My next tip is to use kitchen tools that make cooking times quick, so you can get dinner on the table fast! 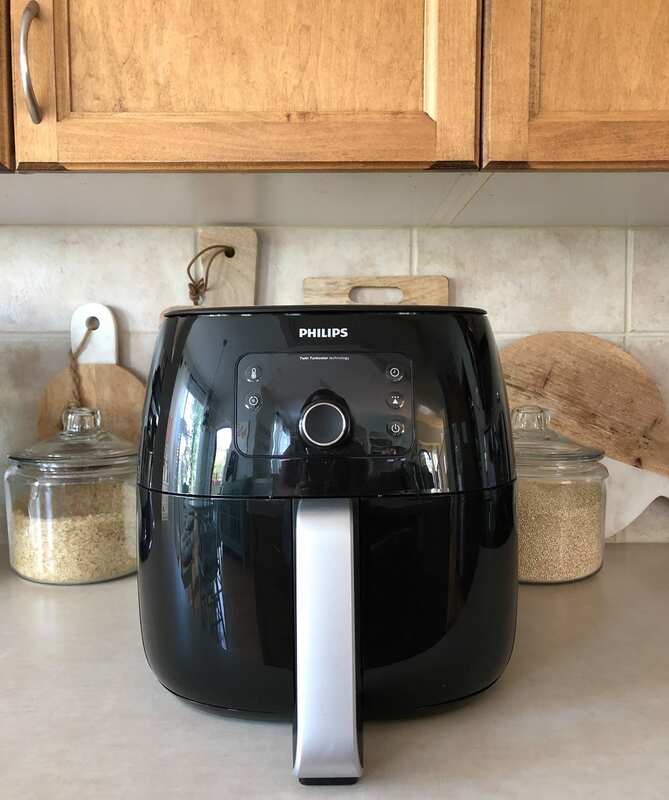 One of the best kitchen tools that I have added to my kitchen is the Philips Airfryer. Since having an Airfryer in my kitchen arsenal, I use it a lot. A lot. For potatoes, fries, crispy wings, roasted vegetables and pretty much anything that I don’t want to cook in oil. 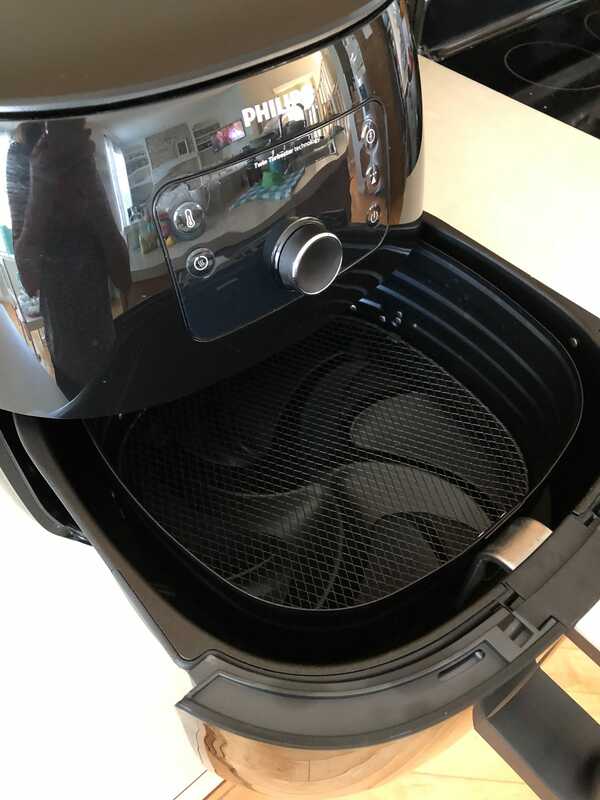 Recently I tried out a new Airfryer model, the Philips XXL Airfryer which is the largest Airfryer that Philips sells. And I have to tell you, I’m LOVING the larger size of this model. With a 3 pound capacity (6 portions) the Philips XXL Airfryer easily handles a whole chicken or two bags of fries! This is awesome for my family of 5…I can make enough food for all of us without having to do it in batches. And it also means that I can have dinner on the table fast. Recently for dinner I used this new Airfryer to make zucchini fries. With zucchini, zucchini, zucchini everywhere, I buy loads of it for baking and for dinner side dishes. 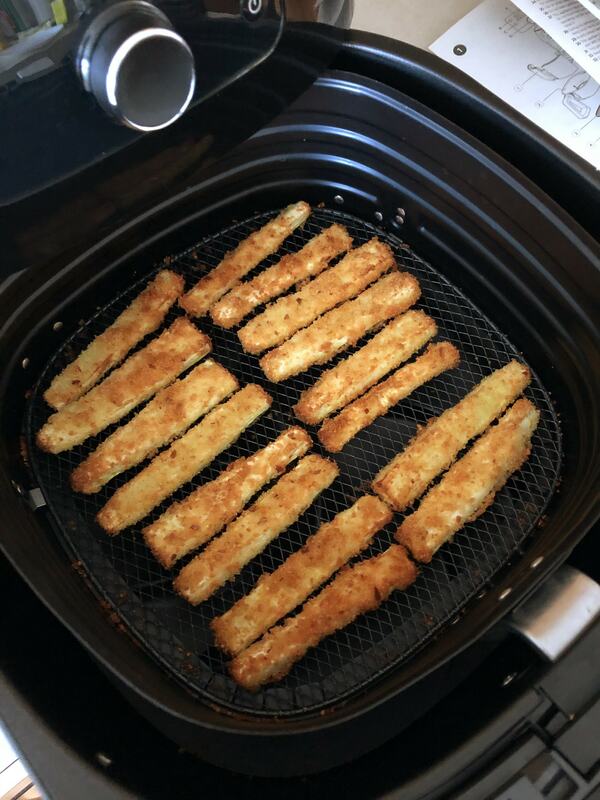 One of the first things I was excited about making were Airfryer Zucchini Fries. 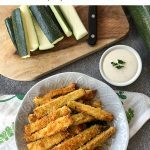 I love zucchini fries, but don’t love having to fry them in oil…and now with my Airfryer I don’t have to! The XXL uses hot air to fry your food with a tablespoon or less of oil, or even no oil! So with less fat and no oil these are basically guilt free zucchini fries. Yes. These zucchini fries are SO easy to make. 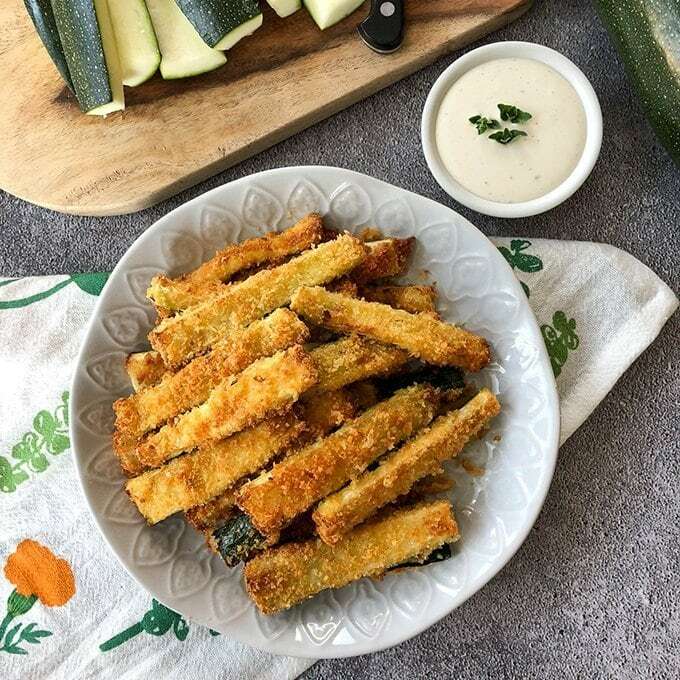 10 minutes of prep and 20 minutes of cook time, you end up with crispy, delicious zucchini fries. So good. 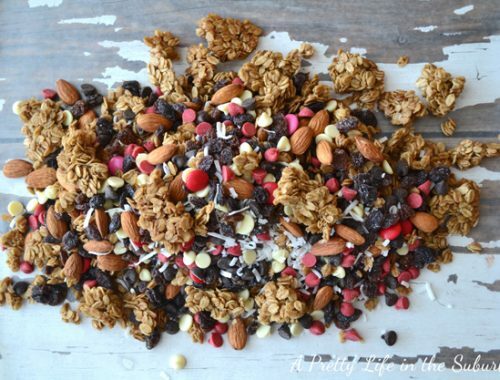 Oh, and did I mention you only need 5 simple ingredients to make them? The fries are coated in a bread crumb/parmesan cheese mixture and added to the Airfyer. You can load up the basket and layer the fries as well…I’ll do that if I’m making a really big batch…I just lay them in such a way that air can flow freely between them so they’re crunchy on the outside. 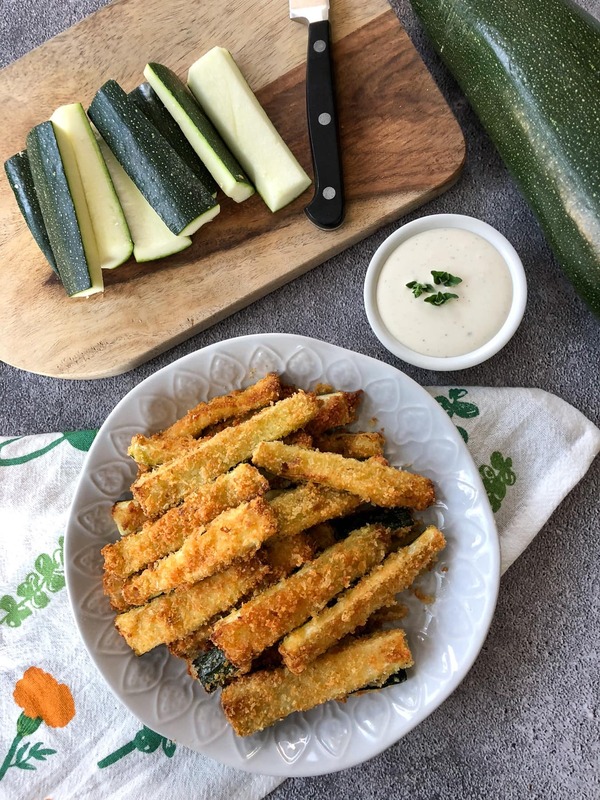 Crunchy on the outside, tender and firm on the inside…just the way a zucchini fry is supposed to be. A delicious weeknight side dish that is perfect with roast chicken! Enjoy. Cut the whole zucchini into 4 inch chunks. 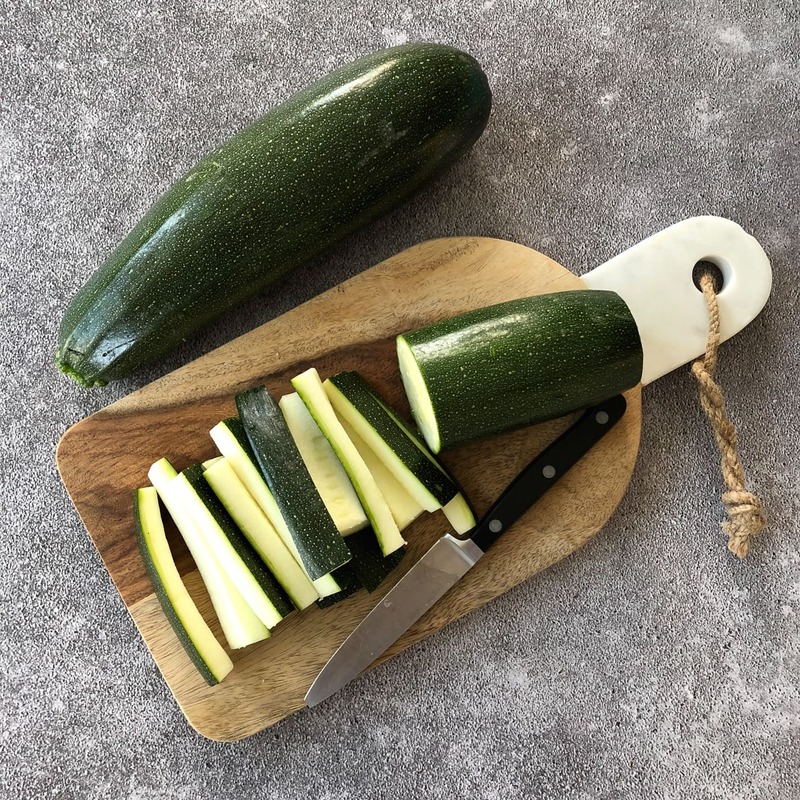 Then slice the zucchini pieces in half, then again into quarters, making them 1/2 inch wide pieces (the sticks should be roughly 4 inches long and a 1/2 inch wide). Trim off the seeded centres. In a bowl combine the bread crumbs, parmesan cheese and seasoning salt. Dip the zucchini pieces into the melted butter. Then roll them in the bread crumb mixture. 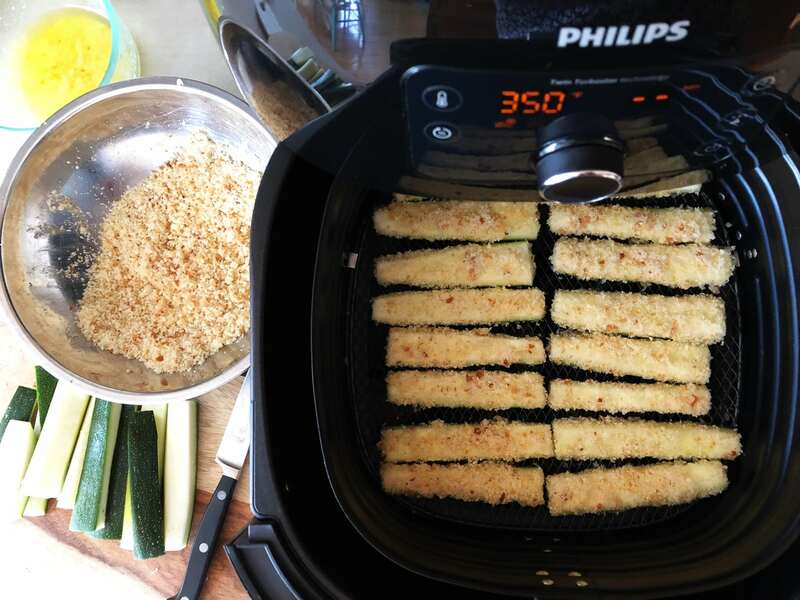 Add the zucchini fries to the Airfryer basket, making sure not to fill it too full. Fry them for 20 minutes at 350 degrees. The size! This model has a large basket so I can cook in batches big enough for my family. It fits a whole chicken or 2 bags of French fries! It doesn’t require oil! I love that foods turn out crispy and delicious without unhealthy oil. 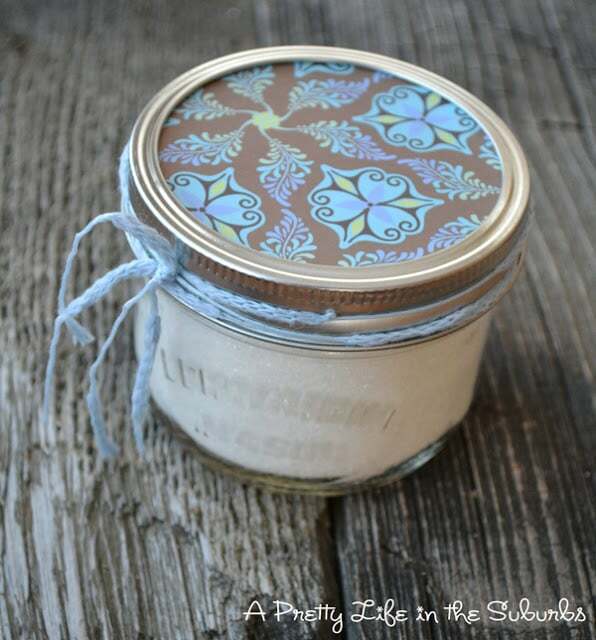 It also removes excess fat for healthier meals and snacks! It’s SO easy to use and cooks fast! 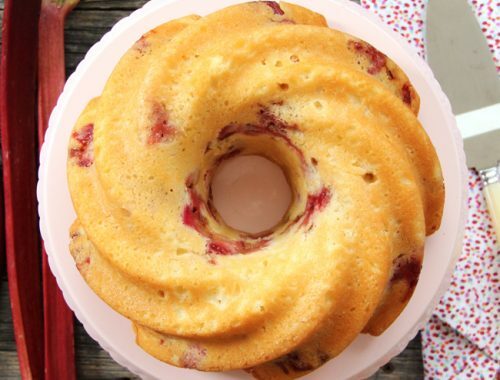 Just place your food in the Airfryer basket and set the time…cooking is four times faster than a standard oven! This model has a storage box for the cord right on the appliance…I love not having cords dangle during storage. It’s easy to clean. It has a removable QuickClean basket and non-stick drawer for fast, easy and dishwasher-safe cleaning. This is the most powerful and largest Airfryer from Philips. The TwinTurboStar technology constantly circulates heat, extracting excess fat from food, and captures it all in the bottom of the Airfryer. The Starfish design at the bottom of the pan circulates air 360°, resulting in the most evenly cooked food. 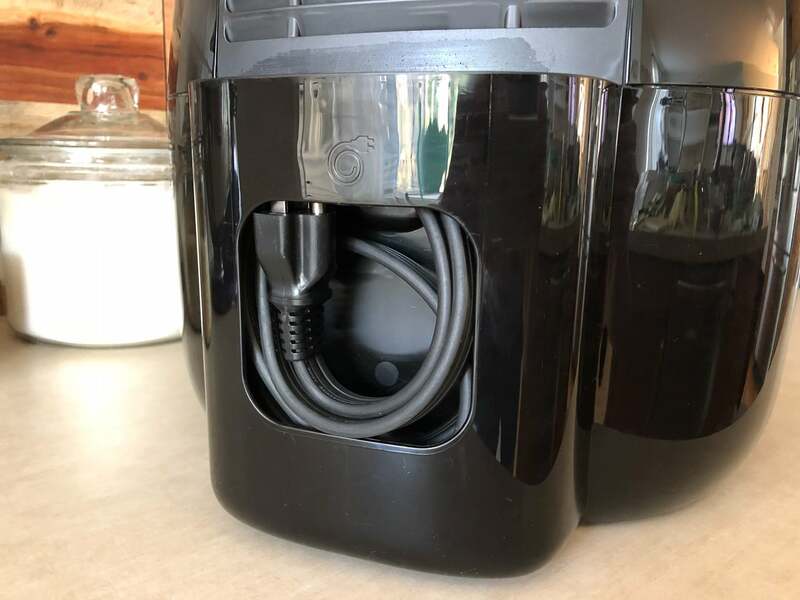 The digital model of the Philips XXL Airfryer will be available online and in stores across Canada this September including at: Hudson’s Bay Company, Amazon, and specialty appliance retailers.